Park(ing) Day seeks to reclaim parking spots and transform them into engaging, people-friendly parking spaces for one day a year. Parklet designed by Jacobs/Wyper Architects, on the 200 block South 13th Street, complete with a plant & pumpkin checkerboard. 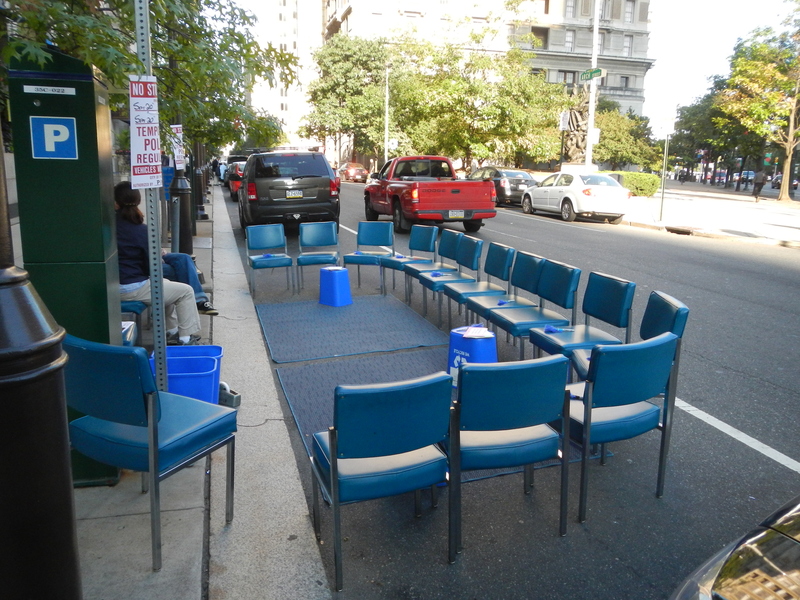 I first learned about this event through a Twitter post by @EPAregion3, that led me to a blog post titled Explore Environmental Careers with EPA’s Park(ing) Day Parklet! I actually had heard the term “parklet” before – I even visited the first parklet in Philadelphia a year ago. But an entire city – filled with parklets for one day? This was something that I knew I wanted to see for myself. OK, students, you are probably thinking…. 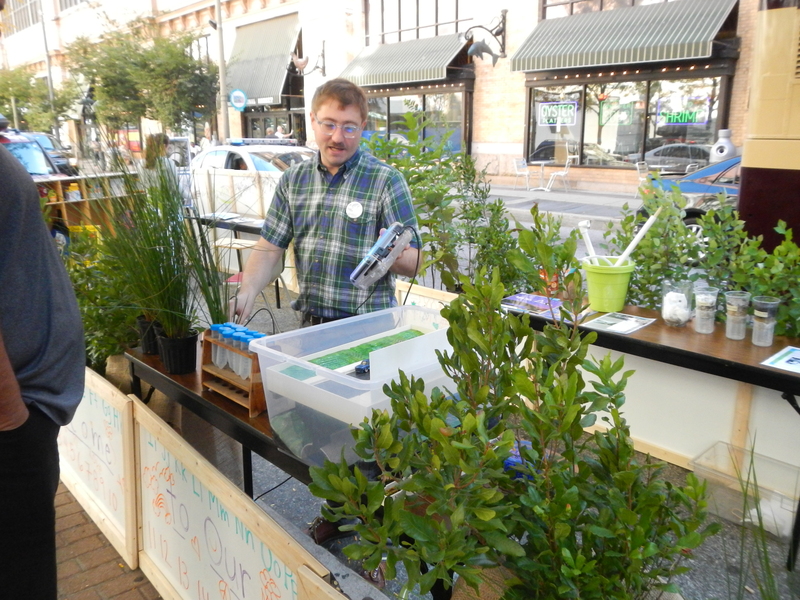 “why is Dr. G blogging about visiting a parklet? She only blogs about conferences and field seminars.” Yes, students, you are correct – just about all of my blog posts about the professional development I engage in away from campus that involve structured conference presentations or organized fieldtrips. But I think it is just as important for students to know about the other investigations that faculty do, when we check out a museum display, attend a seminar, or other activities outside of class with one of the following objectives: seeing if this topic/exhibit/concept can be used in classes and taught to students. This is how I approached my time in the city this morning – can I use the topic of parklets in any of my courses? Will covering parklets advance my teaching goals? And – dare I think – could we even create our own parklet on campus??? 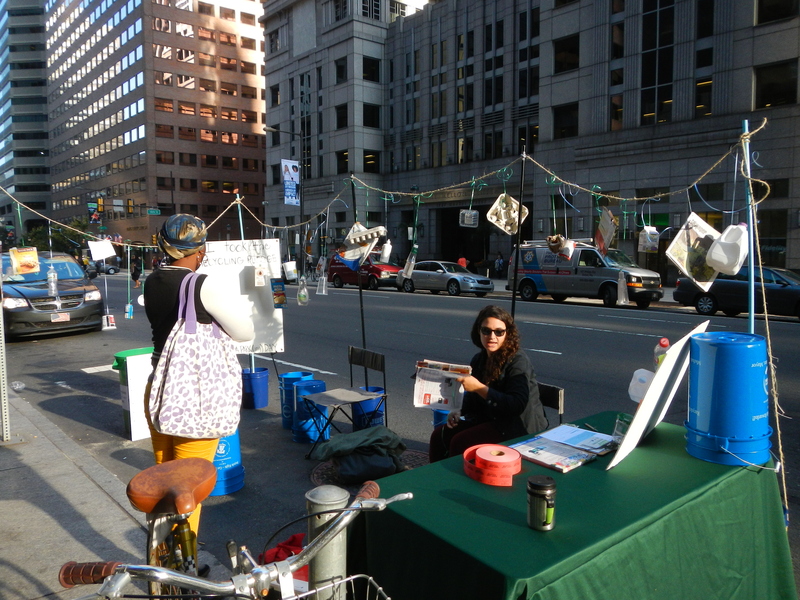 Let’s start with the purpose of Park(ing) Day Philadelphia. The number of parks throughout Philadelphia increases dramatically each year on the second Friday in September, when activists, artists, architects, and other citizens transform metered parking spaces into temporary public parks. Known as Park(ing) Day, this annual event re-imagines the possibilities of 170 square feet of public space. The event celebrates parks and other public spaces in cities across the country, and raises awareness of the need for more pedestrian-friendly spaces in our urban areas. 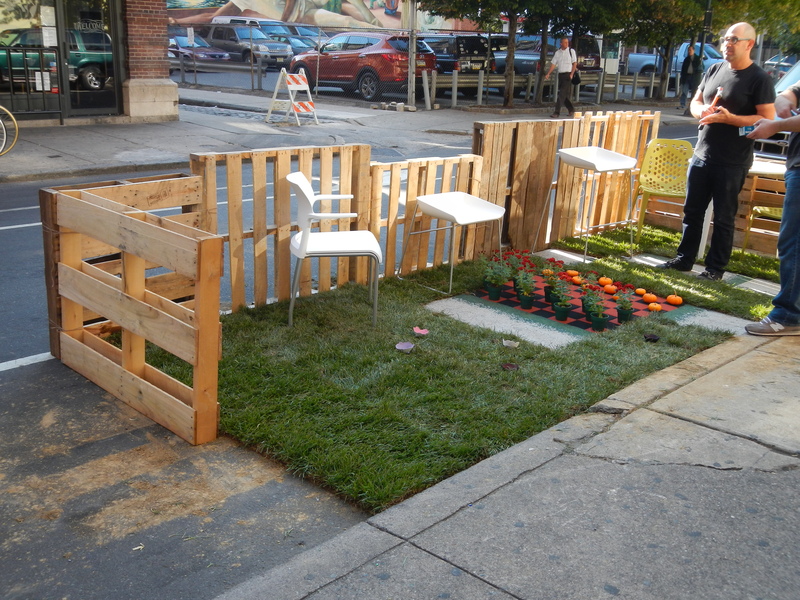 I found some images on the Park(ing) Day Philadelphia website, and I was so impressed with the combination of creativity, innovation and outreach presented in a public space – in this case, a parking space! The Philly event was scheduled to kick off at 9AM, so I arrived right away in the city, armed with my Park(ing) Day map, and started my journey to the spots on the map. Unfortunately, most of the sites I walked by were not ready by 9AM – some hadn’t even started setting up. I was disappointed that most of the parklets marked on my map were not there, but these ones below (and the one pictured above) were certainly worth walking around to see! The Fairmount Park Conservancy and Philadelphia Parks & Recreation set up on the 50 block of N. 16th Street with lots of grass, plants, and even turtles! The Philadelphia City Planning Commission set up a simple yet eye-catching space on 16th and Arch Streets. People were encouraged to sit down and answer questions on cards that were then hung on a tree that the seats were facing. My third stop was to see Philadelphia Recycling Rewards on the 1700 block of Market Street. I really liked the recyclable materials hanging around the spot. Unfortunately, I could not enter the raffle for the free green recycling bucket (only for Philly residents), but I was able to take the Philadelphia Recycling Pledge! The Community Design Collaborative and Philadelphia Water Department on the 100 block of North 12th Street had a clever classroom setup and a chalked hopscotch game on the sidewalk. Check out Phil and Phyllis from the happy home in the back of a flatbed truck on N. 16ht Street! Each of these spots were fun to visit and brought a smile to my face. I also appreciated the enthusiasm of the volunteers participating at the spots and their willingness to come up to me and explain their design and mission. Which one was my favorite? The outdoor classroom certainly gets high votes from me – probably because I’m always looking for ways to take students outdoors, and their classroom/library/wet lab was certainly set up for learning! 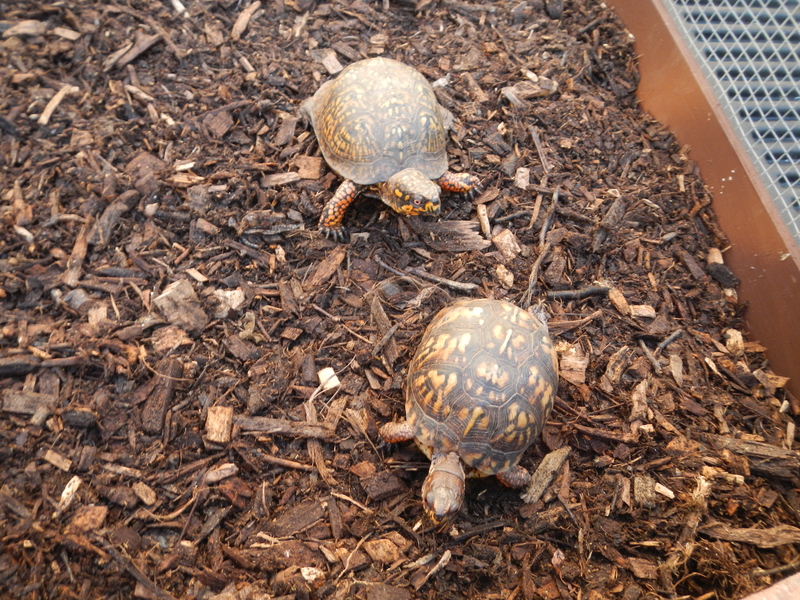 But I also liked the Fairmount Park Conservancy and Philadelphia Parks & Recreation – how could I not like the Eastern Box Turtles, Phil and Phyllis??? I learned that public spaces can be established in urban environments for community-building, conversations, and education, and we should always look for ways to create more of these sites. I learned that parking spaces in Philly can be fun! 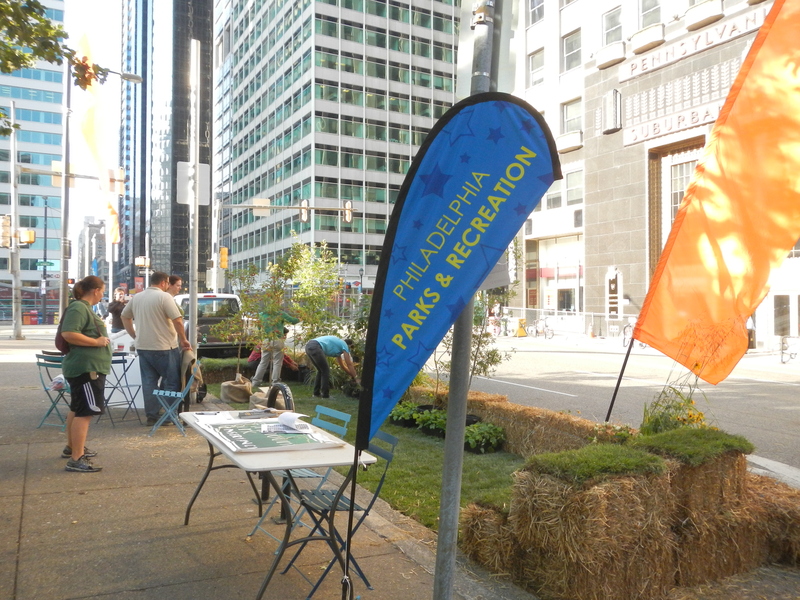 If anyone is looking to go to Park(ing) Day Philadelphlia next year, I would encourage you to wait until late morning or early afternoon, after all of the parklets have been set up to see more around the city. Since I’ll be on campus next year teaching and unable to visit the event, maybe I can bring the concept of the parklet to Penn State Brandywine! We do have beautiful green space on campus, but since we are a commuter campus, we have a huge parking lot along Route 352 that separates the busy road from the campus buildings and activities. There’s no reason we couldn’t set up a mini-parklet in the middle of the parking lot to raise awareness and connect with this nationwide effort. As the campus is only 20 miles outside of the city, plenty of students have been in the city and would be able to connect with the theme. Hmmm….. I wonder if students would be interested…..